At USC’s foremost red-letter day, a crowd of 25,000 students, faculty and proud family members will hear former Secretary of State Warren M. Christopher deliver the 116th commencement address. During the Friday, May 14, ceremony, President Steven B. Sample will confer 4,391 bachelor’s degrees, 2,903 master’s degrees and 910 doctorates. This year’s 8,200 expected graduates include students finishing course work during the upcoming summer sessions, as well as those who completed their programs during the 1998-99 academic year. THE PROCESSIONAL march into Alumni Memorial Park will begin at 8:30 a.m., followed by the commencement ceremony at 9 a.m. Rabbi Susan Laemmle, dean of religious life, will deliver the invocation. Christopher, a 1945 USC alumnus who will receive an honorary doctor of humane letters degree, has had a distinguished career as a diplomat, civic reformer and private attorney. (See story, page 5.) He has served three presidents; most recently he was Clinton’s secretary of state from 1993 to 1997. His name is memorialized in the Christopher Commission, the popular name for the Independent Commission on the Los Angeles Police Department, which he led in the aftermath of the Rodney King beating. Along the way, he has become known for his integrity, self-discipline and diplomatic skill. He was celebrated as a national hero for helping arrange the release of the American hostages in Iran and called “the finest public servant I have ever known” by Jimmy Carter, who awarded him the Medal of Freedom, the nation’s highest civilian award, in 1981. • Jon M. Huntsman, chemical company executive and philanthropist, who will receive an honorary doctor of humane letters degree. Huntsman is founder and CEO of the Utah-based Huntsman Corp., the world’s biggest privately held chemical company. He was ranked one of the 10 top philanthropists by Forbes magazine in 1997, with lifetime charity donations then of $250 million. • Rosa Parks, civil rights activist, who will receive an honorary doctor of humane letters degree. Parks became a pivotal figure in American history when she refused to give up her seat to a white man on a Montgomery, Ala., bus in 1955. Her arrest touched off a 13-month boycott by blacks that led to a Supreme Court ruling outlawing segregation on buses and the emergence of Martin Luther King Jr. as a national leader. • Flora L. Thornton, arts patron and philanthropist, who will receive an honorary doctor of humane letters degree. In March, Thornton gave $25 million to the USC School of Music, which was renamed in her honor. Thornton has also endowed a chair in preventive medicine and the Flora Thornton Cancer Prevention and Research Education Center, both at the USC Norris Cancer Center. Valedictorian Alaina K. Kipps, a psychobiology major and co-captain of the USC women’s volleyball team, will speak at the general commencement ceremony. Huntsman, who received his MBA from USC in 1966, will address the USC Marshall School of Business satellite ceremony for graduate students at 6 p.m. May 14 in the Shrine Auditorium. 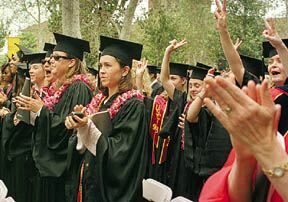 Other speakers at satellite ceremonies after the main ceremony include Los Angeles Dodgers CEO Bob Graziano, for the Leventhal School of Accounting; U.S. District Judge Nora M. Manella, Law School; Kenneth Clarke, British member of parliament, Group 3, College of Letters, Arts and Sciences; and actor-producer Henry Winkler, School of Theatre. USC trustee Barbara J. Rossier will speak at the ceremony for the USC Rossier School of Education. In September 1998, Rossier and her husband, Roger, gave $20 million to the school, which was renamed in their honor. At its satellite ceremony, the School of Journalism will present its first Dean’s Medal for Courage in Journalism to Veran Matic, editor in chief of Radio B92, the only locally run, non-government controlled news and information station broadcasting in Serbia. After Serb officials halted the station’s radio transmissions, Matic continued to broadcast over the Internet. Officials halted the Webcasts on April 2, and Matic was briefly imprisoned. NEW THIS YEAR will be a two-hour professionally produced video recording of the ceremony, available from University and Alumni Events. Order forms for the video, which will be aimed at graduates and their families, are being mailed to all graduates, said University Marshal John Callaghan. Forms can also be downloaded from the main USC commencement Web page (see box below). Dennis Cornell, executive director of University and Alumni Events, will be the commencement announcer. It’s the seventh year that Callaghan, a professor of exercise science, will coordinate the day’s events in his role as university marshal. “It’s still enjoyable, still a marvelous experience,” he said. “Everyone on campus is involved. The committees that we have put together are all first class. Planning commencement has become a year-round activity for the committees involved, Callaghan said. Organizers will meet the week after the 1999 version to discuss what went well and what didn’t. In September, they will start planning the 2000 ceremony.